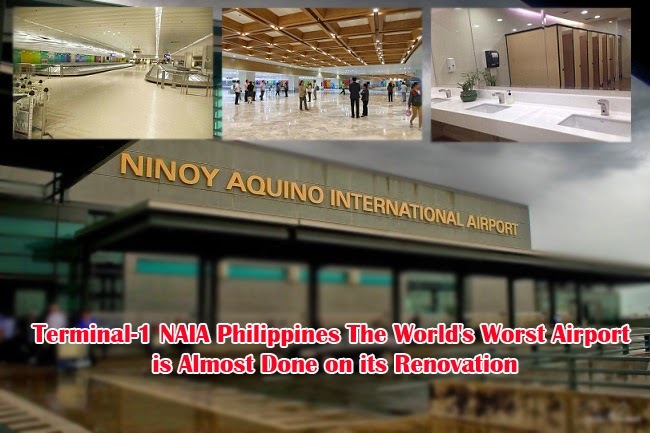 Ninoy Aquino International Airport Terminal 1 (NAIA-1) rehabilitation and face lift are almost done, giving hopes to many that perhaps it would make the airport better and finally step down from the rank as the worst airport in the world. After 30 years, the airport will finally have a fresh look to show the local and foreign passengers. Abigail Valte, Deputy presidential spokesperson, had conducted inspection in the rehabilitation works in the airport and even shared some of the photos online. NAIA Terminal 1 will soon show its new look. With the rehabilitation the check-in counters, new display boards, air-conditioning system, conveyor belts, better lighting, and lavatories are expected to be greatly improved. Joseph Emilio Abaya, Transportation Secretary, shared that passenger movement areas like the departure and arrival areas are expected to be dine by the end of March while the completion of the whole rehabilitation program will be in May 2015. Passengers will soon be allowed to get to the new check-in and boarding gates. According to Department of Transportation and Communications, electro mechanical, the administration offices, firefighting and structural systems, the baggage handling facilities, plumbing, and the stockrooms are also included in the renovation. Furthermore, Abaya said that the next rehabilitation in the NAIA Terminal 1 will be focusing of the areas where the well-wishers are allowed in. P1.299-billion is the said budget allocated to the rehabilitation and repair of the NAIA-1 to make it far better that the dubbed ‘worst airport in the world’ reputation.